Phuket and Krabi are the two most visited places in Southern Thailand. So there’s a good chance that you will want to travel between these two hubs at some point during your travels. You have basically three different travel options (unless you want to drive there by yourself, but then you probably wouldn’t read this post) and it’s all relatively easy, quick and stress-free. The total distance from Phuket Town to Krabi Town is 165km (from bus terminal to bus terminal), and depending on the type of vehicle it will take you between 2 and 3 hours. 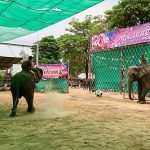 Of course it also depends on the traffic situation – not so much in Krabi but more on Phuket Island, especially the first part of the trip along the Main Road 402 until you pass the Sarasin Bridge that connects the island with the mainland. The trip is one of the most beautiful in all of Thailand. 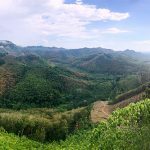 It’s not like up in Isaan where you look out of the window and see only rice paddies and buffalos for hours, but here you will pass all these huge limestone cliffs – the most special one is probably the Elephant Hill in Phang Nga. The most popular way to get from Phuket to Krabi. There are busses traveling between the two cities at least once every hour from about 7am to 10pm. Depending on the type of coach (Standard, VIP, First Class etc.) the ticket costs 150-180 Baht, and the trip takes about 2.5 hours. There’s no need to pre-book your ticket, just show up at the bus terminal and buy it at one of booths of the bus companies. There are two bus terminals in Phuket. You should go to the Phuket Bus Terminal 2 (the newer one of both which is in the northern part of town). They have more frequent departures and newer coaches. If you stay on the beach like Patong, Kata or Karon, a taxi should bring you there for 100-150 Baht. Coming from Phuket Town, you can just hop on a motorbike taxi that should bring you there for about 60-80 Baht. If you don’t want to take a taxi to the bus terminal, you can also book a minibus at one of the many travel agents all around Phuket. The advantage is that they will pick you up directly from your hotel, but the disadvantage is that you have less legroom than in the bus, and if you have a lot of luggage you might even have to buy 2 tickets. The one way fare for the mini busses from Phuket to Krabi Town is about 200-250 Baht if you book your ticket at the travel agencies, and the trip is slightly faster than with the bus – just over 2 hours – because they drive a lot faster. The taxi is obviously your most convenient travel option, but at the same time also the most expensive one. You can just ask one of the drivers in your beach town in Phuket (there are not so many in Phuket Town) and see if they want to do the trip – not everyone will go as they are not sure if they can find a customer in Krabi to drive back to Phuket. If you find one who agrees then you can expect to pay between 1,500 and 2,000 Baht and the trip should take about 2 hours. Sure, you can also book your taxi at the travel agencies, but then again you would have to pay them a commission and the price will be around 2,500 Baht. Makes only sense if you share the taxi with two or three other people. 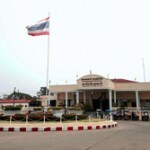 There are no flight connections between Phuket and Krabi. 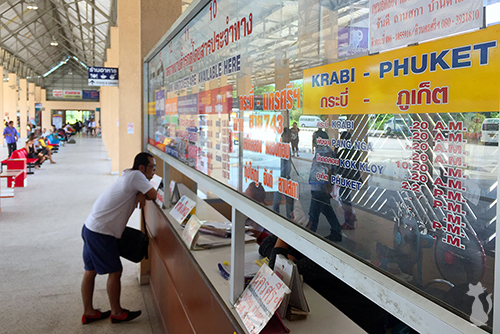 The bus terminal in Krabi is located about 5km from riverside (the main tourist area). To get there, you can either take a songthaew for 12 Baht or a motorbike taxi for about 80 Baht. Busses to Phuket leave frequently (about once every hour) from early in the morning till late in the evening. The ticket price is about 150-180 Baht one way, and the trip takes between 2.5 and 3 hours – yes, just like the other way around. Most minibuses in Krabi Town leave in riverside at the intersection of Kongkha Rd and Utarakit Rd (see the map below). Of course, you can also book your ticket at one of the many travel agents in riverside. It costs about 250 Baht and the trip takes about 2 hours. It’s more difficult to find a taxi from Krabi Town to Phuket than from Phuket to Krabi Town. The best idea is to just inquire at one of the travel agencies in riverside, they should be able to arrange one for you for about 2,500 Baht. The trip takes about 2 hours – same like with the minibus. How about Ferries from Phuket to Krabi? That’s a good question, but not a good idea. Yes, there are ferries serving the Phuket-Krabi route, but it will take you around 4 hours (1 hour from your hotel in Phuket to the pier and waiting time, about 2.5 hours by boat to Krabi Pier and 30 minutes from the pier to Krabi Town) and cost about 750 Baht. Just stick to the street travel as described above, which is twice as fast and less than a third of the price. However, if you plan to visit one of the many beautiful islands in the region, such as Koh Phi Phi, then it does make sense to first take the ferry to the island (like Phi Phi), stay there for a couple of nights and then take another ferry to Krabi. You can check the ferry time tables, prices and even book your ticket online on PhuketFerry.com or YourKrabi.com. Whats the best /cheapest way to get from airport to the hotel in Phuket? There are minivans in front of the arrival hall going to Patong for 180 Baht, and to Kata/Karon for 200 Baht. They will drop you at your hotel. Thanks, any info on tours that are not over charged to James Bond island?